Stadio Marcantonio (Marc’Antonio) Bentegodi is a multi-use stadium in Verona, Italy used by both big teams in the city, Chievo and Hellas Verona. The ground has a relatively large capacity of 38,402 compared to attendance figures for both teams but still offers a quality and unique match day experience. 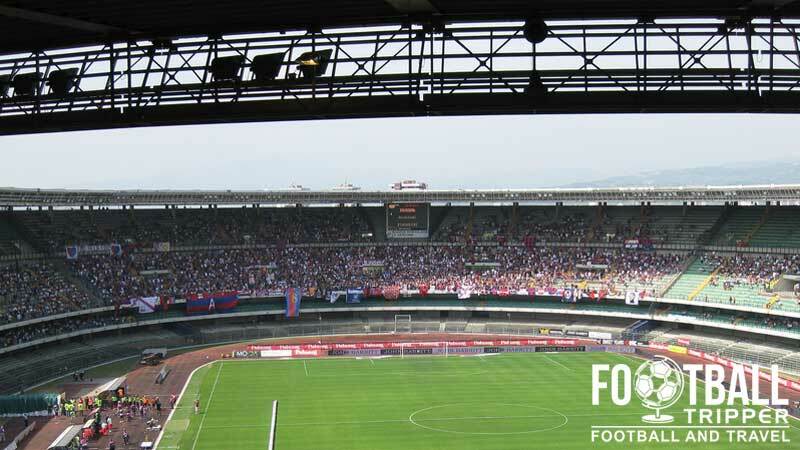 Originally opening in 1963, Stadio Bentegodi back then was a slightly different proposition to what it is now, originally consisting of only two tiered, both of which were uncovered leaving Veronian fans exposed to the admittedly mild elements. Built at a time when Hellas Verona were languishing in Serie B, many critics suggested the stadium’s capacity was too large and not befitting of a team who couldn’t make it to the top tier of Italian football. Over time these concerns about Italy’s 6th largest stadium have all but abated due to the rise of both residents into Serie A. Known as the stage of the forty thousand due to its number of seats, the stadium named after Verona’s famous 19th century sports benefactor was used as a venue in the 1990s World Cup. Marcantonio hosted three group matches and the early knock-out round between Yugoslavia and Spain. The stadium received a number of renovations in preparation of the major sporting event including the addition of an extra tier, full roofing and better transport connections including a new section of road linking the city directly to the motorway. In recent years there have been further plans to redevelop the stadium but nothing has come to light as of yet. In recent years work to improve the bottom tier of the stadium was abandoned with these seats subsequently closed. A failed bid to the host the 2016 European Championship meant the 40 million euro dream of making the stadium “More English” fell by the wayside. 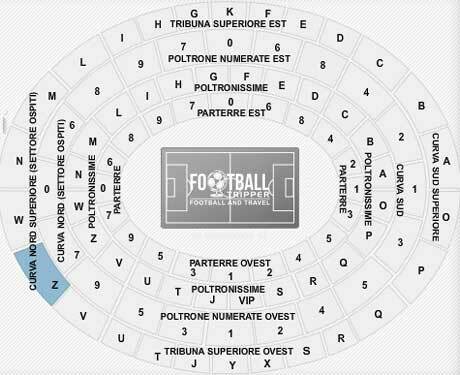 Bentegodi can be divided into four sections: Curva Nord, Tribuna Est, Curva Sud and Tribuna Ovest. Regardless of which Verona based side is playing at home away fans are housed within the upper two sections of the Curva Nord. Centrally located right behind the goal, despite the problematic existence of the running track views from this part of the ground are actually pretty decent. The relatively low-hanging roof ensures the noise inside the stadium travels well, and being sat opposite the Chievo ultras ensures a lively back and forth between supporters as the match unfolds. For the larger teams who are capable of bringing enough fans to occupy the central block the Bentegodi can be a great experience, however when there’s just a handful of away supporters, the size of the stadium can feel slightly too cavernous – particularly since the closure of the lowest tier of seating in seasons gone by. With a population of around 265,000 you can rest assure that there are a few watering holes in the famous Shakespearean city. Whilst there aren’t too many pubs around the Bentegodi it isn’t really a problem as the centre of Verona is eminently walkable. There’s not a lot of choice when it comes to eating and drinking at Italian football matches but there are a handful of places around the ground such as on Via Leonardo Da Vinci which serve slices of Pizza and the Piazzale Olimpia road which has a few places to drink such as Bar Bentegodi behind the Curva Sud. Although fans can purchase merchandise of either club at the stadium on matchdays it appears that both teams operate their main club shops in different locations around the city. Located 10 minutes north of Stadio Marcantonio Bentegodi just past Corso Milano next to the canal. The full address is: Via Luigi Galvani, 3, 37138 Verona. Usually open between 9.00 am – 12.30 pm and 3.00 pm – 6.30 pm, you can find out more information by sending an email to [email protected] or visiting Chievo’s online store. 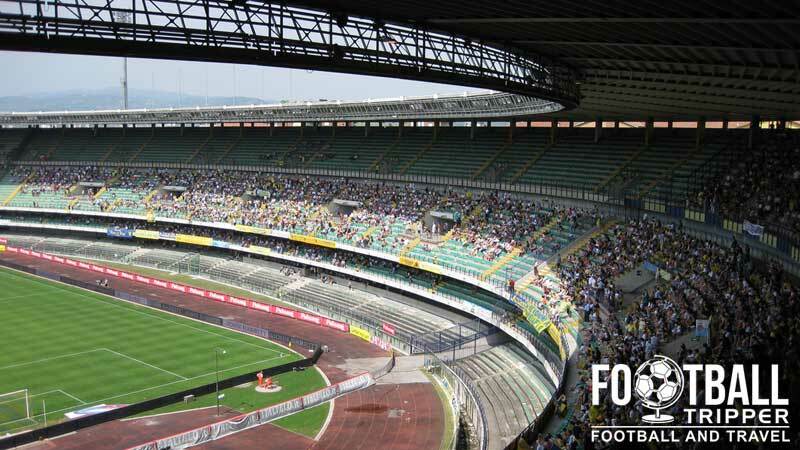 Situated 15 minutes east of the stadium, and 10 minutes north of the Porta Nuova station. The full address is: Vicolo Morette, 4, Verona but for more information please visit the official online store or phone the shop on +39 045 596-756. The big man Luca Toni inside the Hellas Verona Store. Still going strong and scoring goals as of 2015, enjoy this legend of the Italian games whilst he lasts. A tour of Marc’Antonio Bentegodi doesn’t exist as the ground lacks the commercial sensibilities of more modern, purpose built football stadiums. As we suggest for all stadiums without tours, just get there early and have a walk around. In some cases you can get a little tour if you speak to ground staff when it is quiet or even just a little peak into the empty ground which is still quite cool. 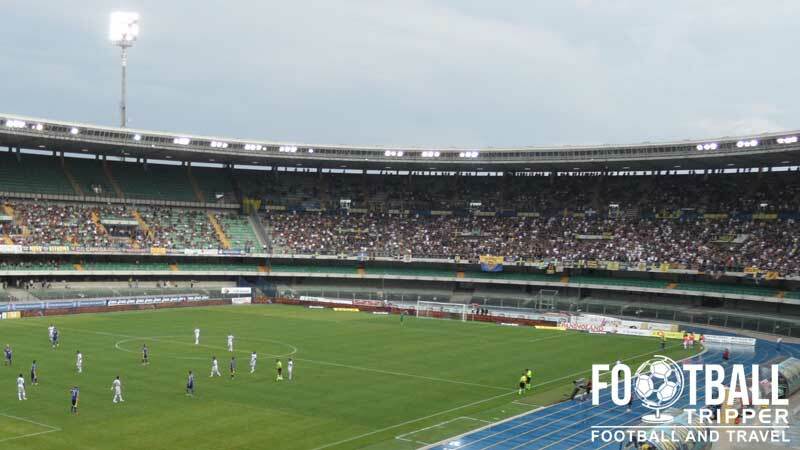 Tickets for both Hellas and Chievo Verona are available to buy online, at the stadium’s box office behind the Curva Sud in the weeks leading up to the match, and from various resellers around the city including the Banca Popolare di Verona. 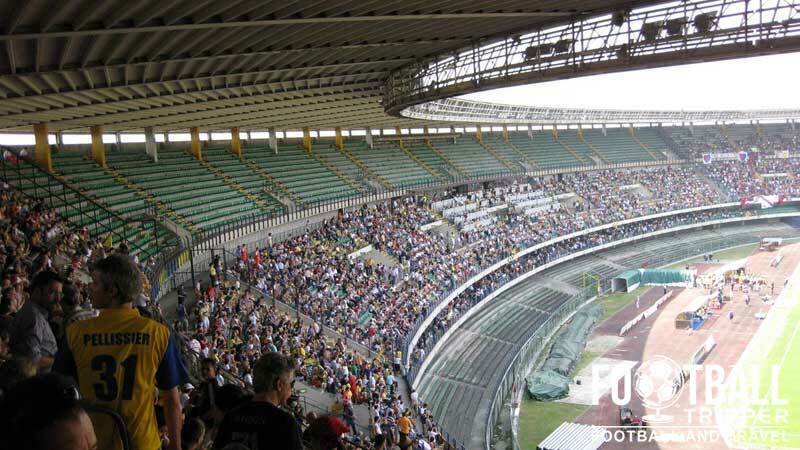 With the large capacity of Bentegodi neither team sells out their home matches meaning you can usually buy tickets on the day of the match, but if you can avoid it, it’s probably for the best. Bentegodi stadium is located less than 2 miles west of Verona’s historic city centre and is easily accessible via a number of forms of transport. Parking wise options are quite good with a number of large car parks around the surrounding roads as shown on the map above. The main railway station of the city is Verona Porta Nueva which is on the Milan-Venice line and located less than 15 minutes walking distance from the ground. The main station of Verona is known as Porta Nuova, it would appear that this old Carriage is a Chievo fan. Outside there is a bus station with many services taking you to the stadium such as numbers 11, 12 and 13 and the number 90 on Sundays and bank holidays. Verona Villafranca Airport also known as Valerio Catullo is located 12km southwest of the historic city centre with the shuttle bus and rental car taking you to your central hotel in less than 20 minutes. There are a few independently run B&Bs around the stadium with the Hotel Porta Palio across the river Adige probably being the closest and most comfortable choice for those wanting to stay near the ground. As the historic area is less than 15 minutes away it would be a shame not to stay more central with there being too many potential hotel choices to mention.